Yes, I realize today is the last day of the month, but I have to talk about this. 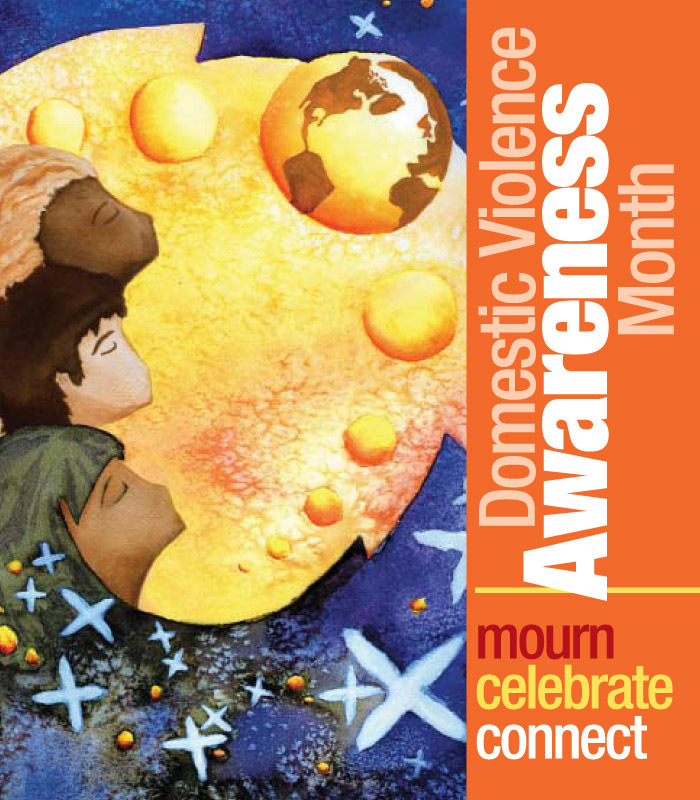 One thing I didn’t write about this month is that October is Domestic Violence Awareness month. I thought about writing it. I thought about it almost every day, but I didn’t write. This is a topic close to my heart but still I didn’t write. The reason why this topic is close to my heart is that I spent 7 years in an abusive relationship. He would mentally, emotionally and physically abuse me. I left him on St. Patrick’s Day and never looked back. Someday I would like to write about it in detail, but even after 16 years of freedom, it’s still difficult to talk about sometimes. Someday, when I’m ready, I will tell you all my story. I know today is Halloween and people are gearing up for trick-or-treating and other fun activities, but please take a moment to think about the abuse that women (and men) are dealing with every day. One in four women have or will experience domestic violence in their lifetime. Nearly three out of four Americans will know someone who is or has been a victim. You already know one. You know me. Even just now, I wrote the title and then left the computer. Why? Why am I so subconsciously opposed to writing? We talked about this in therapy. My therapist wanted me to start a journal. I wrote the first three days, missed a day, wrote, and now it’s been two or three days since I picked it up. Why? After exploring it in therapy, I know why. I probably didn’t need therapy to tell me this, but I did need to think about it for myself. You see, any time I tried to keep a journal, my mother would read it. I remember one time, I was in junior high at the time, I wrote out on a couple of sheets of paper how I felt about my home life. I wrote that we (my mother, father and I) were three strangers living under the same roof. My mother found it, read it, and beat me for it. It was the last time she ever used the leather belt on me. I kept a journal for a while when I was recovering from my car accident. I had to stay with my mom because I had no where else to go during my recovery. I kept my journal buried in the nightstand next to my bed. It didn’t matter because she found it and read it. I can’t remember how I found out, but I did. Since then, I have intermittently kept a journal. I will buy all these cool journals but then never write in them because I feel that they are too good for whatever I have to say. Or I will start a journal and not finish it. I have one, it’s a pretty pink color, that I have intermittently written in since 2008. I’ve gone through about a third of the pages. I would write for a few days, then nothing for six months. When my cat Luna died, I wrote simply Luna died today. The way I wrote it, with such emphasis on the phrase with underlines, I can recall the pain I felt then. I haven’t been writing here either. I did have a busy week last week, since I substituted four days. (One full day, two half days, and a 3/4 day.) It definitely kept me busy and I was tired by the end of Friday. I’ll post more on this separately. Well there. I wrote about not writing. Does anyone else have this problem? If so, how do you get around it? Any suggestions are welcome. Thanks. This is article I wrote for week 1 of The Compassionate Brain series. The original post appears on A Canvas of the Minds. My pdoc recommended a free webinar series called The Compassionate Brain. The basic underlying principle is to utilize compassion when dealing with relationships and other situations, thus impacting the brain and how it functions. It’s actually quite an interesting series. However, I understand that not everyone wants to devote an hour each week to watching a webinar with a bunch of scientists, so I am reviewing and summarizing these episodes on the multi-author blog, A Canvas of the Minds. I will also be reblogging those posts onto this site, but I urge you to check out Canvas for yourself. After talking with my therapist, I’m probably not borderline, even though this test seems to think I am. I answered a couple of questions that I probably shouldn’t have answered the way I did, but oh well. I think part of the problem with this test for bipolars is that bipolar symptoms and borderline symptoms often overlap. So, it could be that my answers relate to being bipolar and not borderline. Or maybe I really am borderline, who the hell knows? Wow. Doesn’t that sound like mania to you? I know it does to me. I’m also really baffled by the Narcissistic, Antisocial, and Schizotypical ratings. (I’ve taken this test before and scored low in these areas – see below.) The descriptions of these disorders – you can follow the link to any of these disorders above – seem to either have nothing to do with my base personality or relate to how I feel when I’m manic. Am I manic now? No, not at the moment, but if you take the test, you will note there are words like ever and occasionally, and other misleading terms. I might occasionally dress provocatively, because I’m manic or maybe I’m just feeling a little feisty and I want to look hot for my husband. I would still answer yes to the question, but it would give the wrong impression to the test. “Do you have trouble not taking criticism personally?” The double negative in this makes me so confused that I’m not sure how to answer the question. Now, I took the test a second time and got answers more similar to what I have gotten in the past. What I did differently is to eliminate anything that corresponds to mania. Where I might have answered yes to something because yes, this happens when I’m manic, I answered no this time because this is not my normal mode of thinking. Here is my second set of results. Note how different these results are. Yes, I have issues, and I will easily own up to dependent and obsessive-compulsive disorder. I am still baffled by histrionic and schizotypical but maybe there is some truth in there that I’m not seeing in myself. I’ll also own up to avoidant because there are many times when I will avoid things, people, and/or situations in order to not deal with them. I don’t think I’m socially inept, but I do feel a little intimidated at parties, especially if I don’t know anyone. Or not. Sometimes I am quite the social butterfly. Really, it all depends on my mood. I guess what I am getting at with all of this is don’t take these online tests too seriously. If you think you have one of these personality disorders, be sure to discuss it with your doctor. Only a trained medical professional can diagnose you properly, and even then they don’t always get it right. It’s been quite a while since I last wrote a 30 Days of Creativity post but then I haven’t been feeling very creative lately. This is a card that I made for my husband. The photo is not so good (slightly out of focus, I fear) but the battery died on my camera and I couldn’t take another one right away. Anyway, I think you get the idea. The image itself was square, and I put a border on it (another sheet of blue, cut larger than the original and glued to the back) but square does not center well on rectangle. So I decided to put it off center and then do something along the side to make it look balanced. I wasn’t sure what to put along the side, however. Then I found this squiggle punch. (I have one just like it and love it!) So I punched out squiqqles and glued them down along the edge. I was going for random, but when you are going for random, you often don’t end up with it – it’s just the nature of the human brain. Ultimately, I just wanted it to look good. 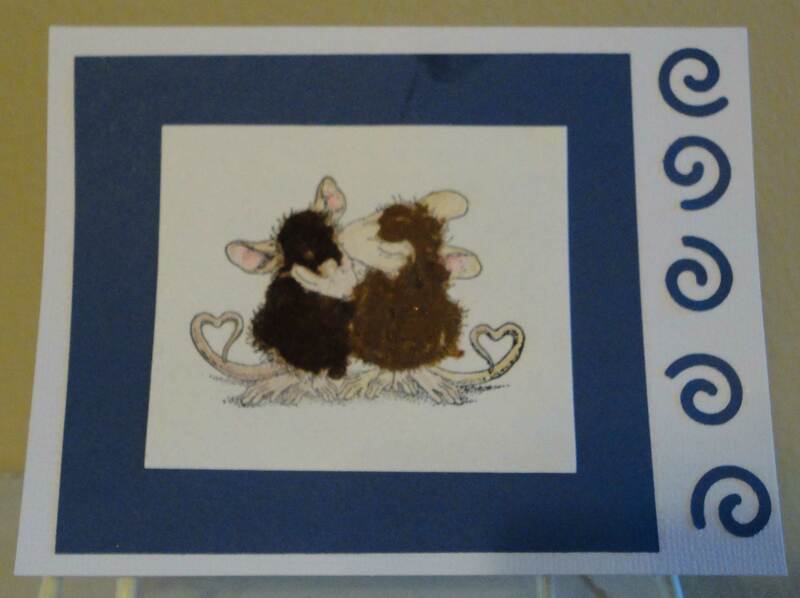 It’s not my best card-making effort, nor is it my best photography, but it is cute and it served it’s purpose. Just a little support card for my husband. I want him to know how much I love him and support him and giving a hand-made card is one way of accomplishing that task. He loves whatever I make for him, and I love him for that – and a million other reasons!